a) External existing databases (referred to as DB1 … DBn) containing relevant toxicological/ecotoxicological information. b) An internal or local database (“local DB”) where terms (“words”) are stored together with their corresponding web links (“references”) to the external databases. 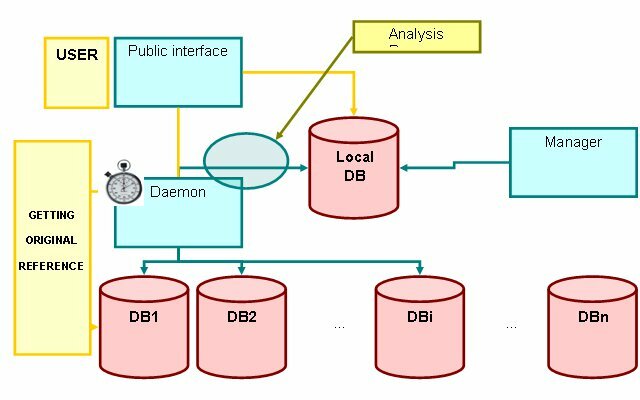 c) An analysis process that periodically scans each external database, analyzes its contents (text analysis and classification) and updates the local DB. Every pair word-reference is thus revisited at previously scheduled times. d) An engine (“Daemon”) that operates the above described process. e) An interface allowing the interaction of the system with the user. f) A system administration back-office.